He was rugged but refined, a collared shirt and natty sweater visible under his weatherproof hooded parka and bib. She was a classic beauty with a workman’s soul, her impeccably crafted hull filled with scallops and gear. Together commercial fisherman Oscar Pease and his catboat Vanity made the perfect pair, the sort rarely seen at the time this photo was taken, and even more rarely now. Catboats, single-masted sailboats half as wide as they are long, were once a popular choice among fishermen, but over the years fell out of use on the working waterfront and instead became the domain of cocktail cruisers and weekend racers. Vanity was the exception. Built in 1928 by famed boatbuilder Manuel Swartz Roberts at the site of the Old Sculpin Gallery in Edgartown, she enjoyed a long, productive life as a scalloping, fishing, and charter boat in Island waters. 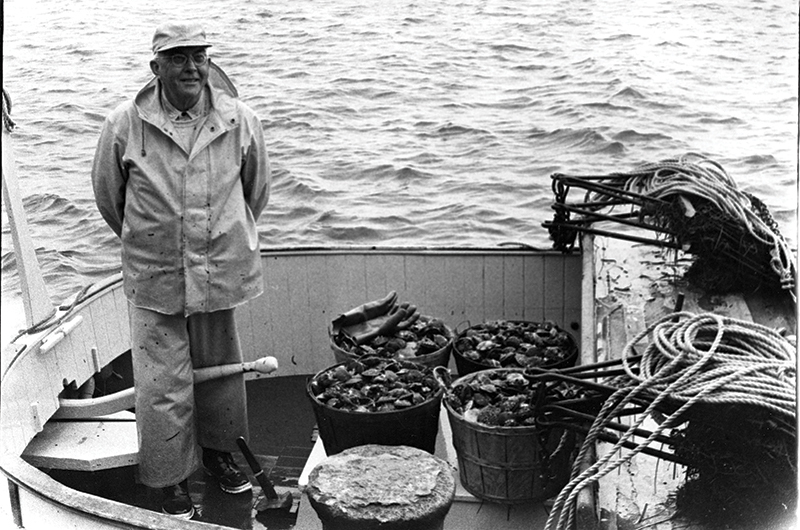 By 1980 Pease was thought to be the last commercial fisherman working a catboat in New England. As a founding member of the Catboat Association he regularly extolled their virtues in the Catboat Association Bulletin, where this photo originally appeared. Following Pease’s death in 1995, Vanity was donated to the Martha’s Vineyard Museum and underwent a significant refurbishment by Gannon and Benjamin Marine Railway. Today she serves as a floating exhibit and charter for a new set of well-dressed seafarers: high-level members of the museum.